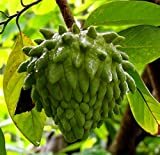 Atemoya growing tree of the genus Annona, and also known as Annona atemoya, is a cross hybrid of Sugar apple and Cherimoya, Atemoya evergreen perennial but in a cold weather become deciduous. Can growing in tropics, mediterranean or subtropical climate and growing in hardiness zone 10+. Flower small green-yellowish, separate times on the same tree female and male flower, the flowers are protogyny at first female and after becomes a male flower, female stage and the male stage afternoon, day after day. Is it necessary to graft or in Atemoya? Small green-yellowish flower, separate times on the same tree female and male flower, the flowers are protogyny at first female and after becomes a male flower, female stage and the male stage afternoon, day after day. What can be done with big quantities of Atemoya fruits?